One of the most difficult to get to but easy access from the upper roadway. 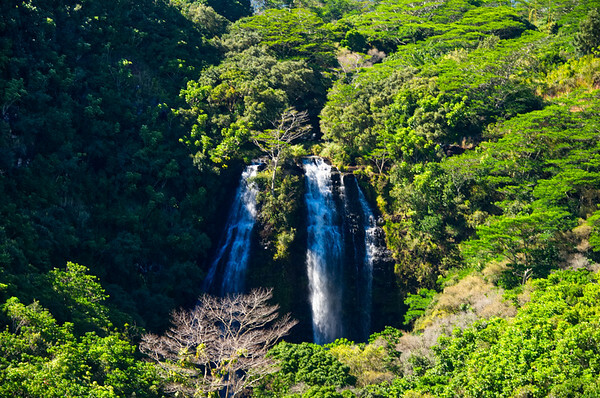 A very impressive and beautiful water fall on the island of Kauai. Fun fact - You may recognize the waterfall from the opening credits scene on the 80's show Fantasy Island. Hwy 50 being the main road to the West side of the island has different areas to pull out to take in the Garden Isle's beauty. This specular view is jus the beginning of the canyon area. 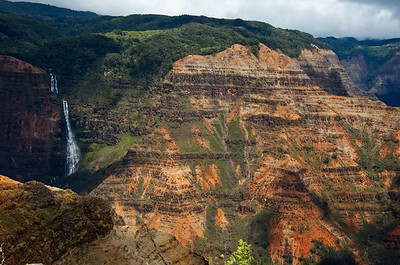 Waimea Canyon, also known as the Grand Canyon of the Pacific, is a large canyon, approximately ten miles (16 km) long and up to 3,000 feet (900 m) deep, located on the western side of Kauaʻi in the Hawaiian Islands of the United States. 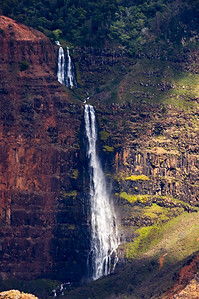 A glorious 800 foot waterfall in Waimea Canyon on the island Kauai, Hawaii. 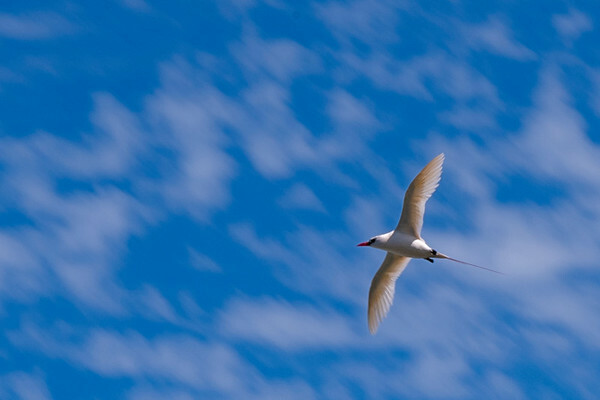 On our way back from Waimea we saw this pull-off. The panoramic orientation really lends itself to accentuate the beauty of this area. 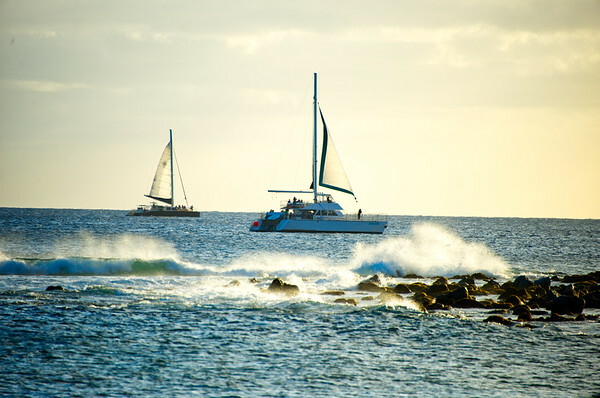 Two catamaran's sailing side by side along the beach that I just happened to be on near the South end of Kauai, Hawaii. 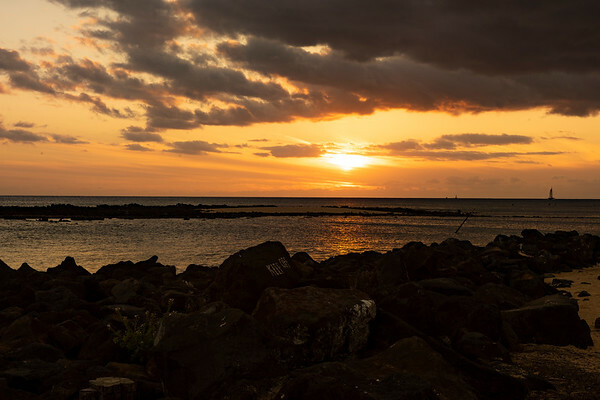 Shot this at Poi pu Beach while waiting for the sun to set. Used a 10 stop filter to allow the waves to blur to a foggy mist. 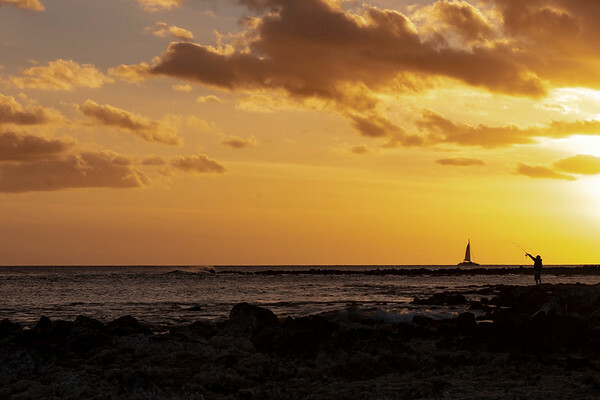 Nothing like a Hawaiian sunset with a sailboat in the distance and a local doing some fishing. 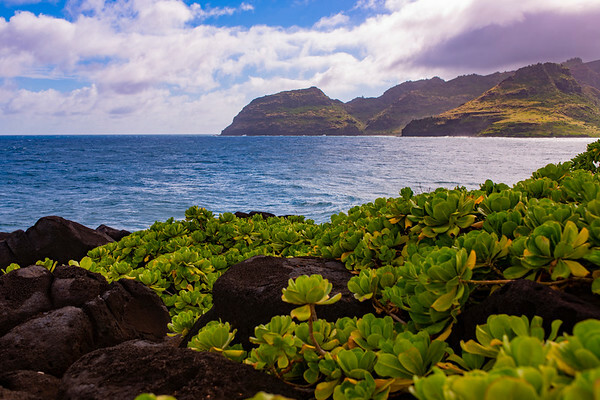 Spectacular views from Poi pu beach. Poi pu beach offers so much with regards too photography. The lava rock, crashing waves with a setting sun in the background. 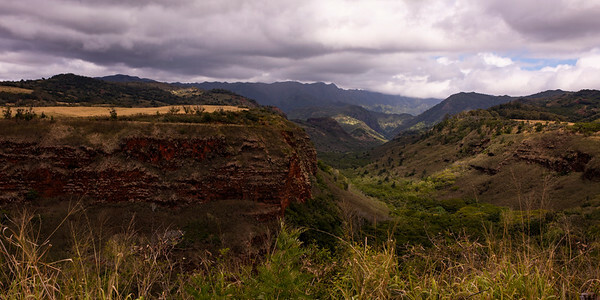 Kauai at it's best! 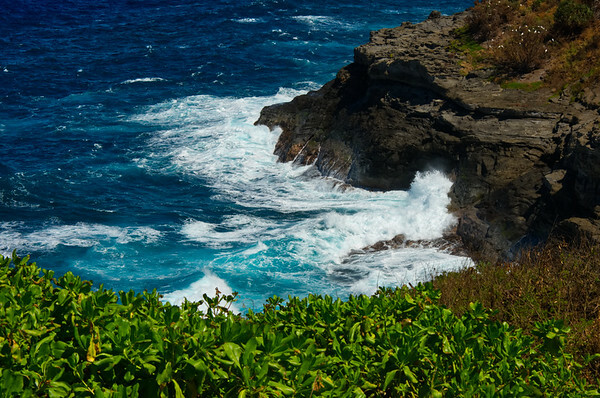 This picturesque point is not to be missed as you explore the North Shore of Kauai. The powerful waves are heard for at least a mile inland. The lighthouse next to this cove was completed in 1913 to guide ships to and from the Orient. It remained in service until it was decommissioned by the Coast Guard in 1976. 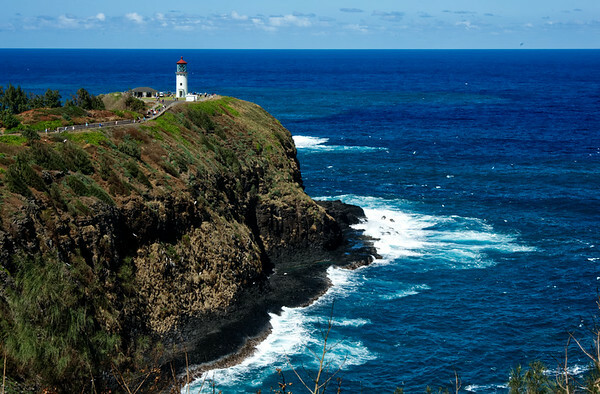 Known today as the Daniel K. Inouye Kilauea Point Lighthouse, this immersive 52 foot structure is situated on a rocky peninsula 180 feet above the Pacific Ocean on the Northern end of Kauai. Commissioned on May 1, 1913 and completely restored in 2013 after over 100 years of dedicated lighthouse duty. Opaekaa means, "rolling shrimp" because supposedly this stream below the falls was loaded with shrimp. 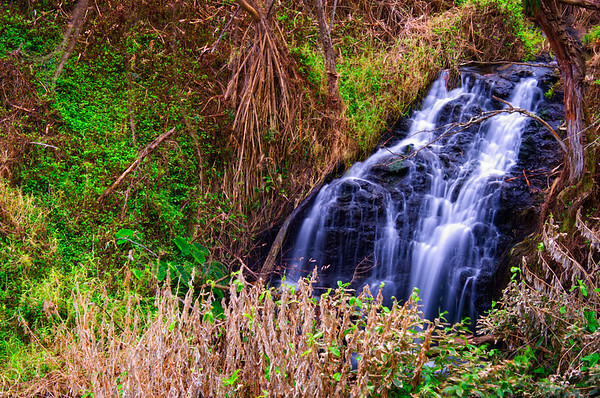 This waterfall is located a couple of miles up Kuamoo Road (580) on the island of Kauai, Hawaii. 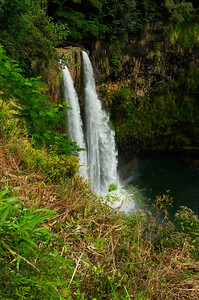 Closer look at the Upper Queens Bath Waterfall, Princeville (Kauai Island, Hawaii). 10 Stop filter image. 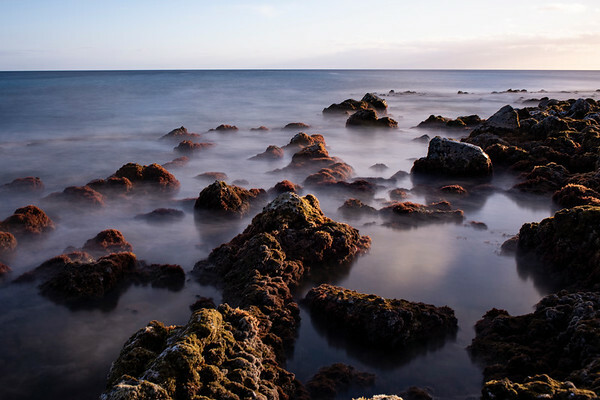 The beach in this photo is softened by using a 10 stop filter with a 30 second exposure. 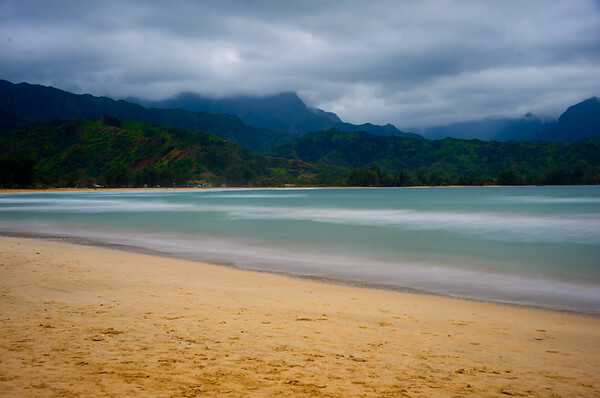 This beach is a must see on the northern shore of Kauai near Hanalei. Just beautiful! In all of its glory. 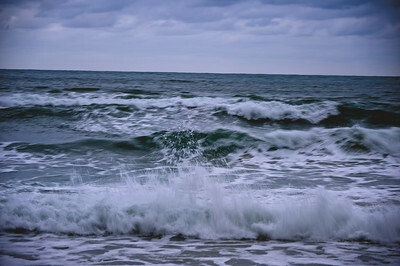 Intimidating crashing waves that just mesmerize the soul. 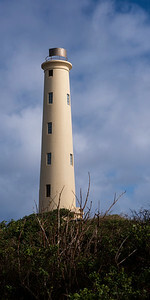 This lighthouse is near the Nawiliwili Harbor on the South end of Kauai. It was built back in 1932. During our visit to the Ninini Lighthouse a rain shower came through. As it moved through caught this stunning contrast between the coastline and the rain shower.